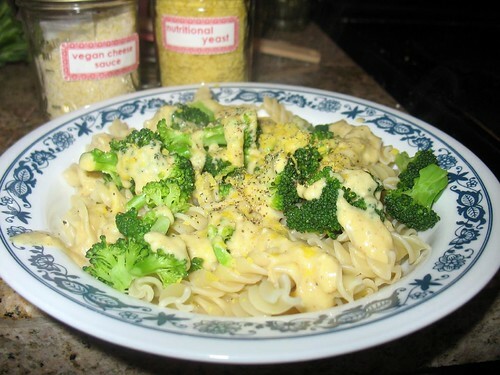 New Wave Domesticity: easy vegan cheese sauce mix. i am not vegan, but i love to try new things and new twists on classic favorites (particularly if it makes those classic comforts a little healthier). this recipe is from "the complete idiot's guide to vegan cooking" by beverly lynn bennett. i was on the hunt to find something simple to bring my vegan coworker who was stuck at home recovering from surgery and when i came across this, i thought it was perfect! you can make a batch of this mix, put it in a jar and keep it in the fridge for up to two months and it takes almost no time to prepare after that! this is like the healthy eqivelent of that orange kraft mac and cheese mess! place cashews, oats, and sunflower seeds in a food processor and process for 2 or 3 minutes until finely ground. scrape the sides down and add nutritional yeast flakes, arrowroot, dry mustard, garlic powder, onion powder, salt, and paprika, and process for 1 minute longer. transfer mixture to an airtight container and store in the refrigerator for up to 2 months. to prepare cheese sauce from mix: whisk together 1/2 cup vegan cheese sauce mix and 1 cup of water or soy milk in a small saucepan, and cook over medium heat, whisking often, for 2 or 3 minutes or until thickened. this makes 1 cup vegan cheese sauce. you can use this on just about anything, i love it over some pasta with steamed broccoli, but it would also be wonderful as fondue or so many other quick meals! it just makes me happy to have a super easy 10 minute, no fuss healthy meal available in the fridge when i need it! and with a cute label, it also made a super easy and lovely gift for a vegan friend! the quicker and easier vationation would be to replace cashews, rolled oats, and sunflower seeds with 1 1/2 cups whole wheat pastry flour or other flour of choice, and simply stir together with the remaining ingredients in a medium bowl. i have not tried that variation yet and i'm not sure how it would effect the flavor, but i am going to try it out next time i make it.